Yay! Now with builds for version 1.0 for both Windows and Mac! 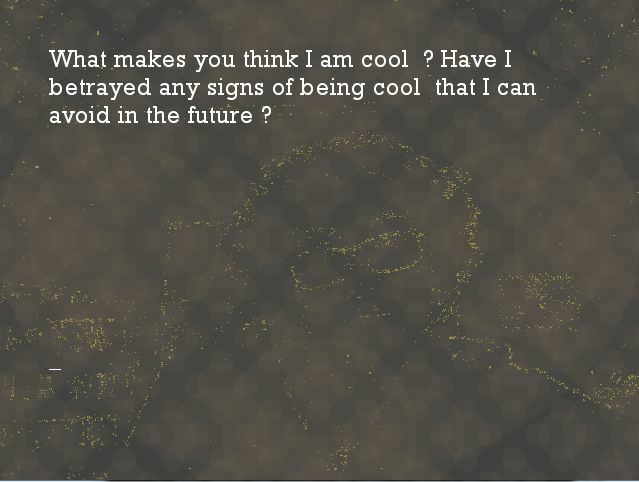 Based on codeanticode's Eliza library for Processing and the computer vision chapter of Learning Processing by Daniel Schiffman, in this little project you converse with a Keplerian alien who is vaguely familiar-looking about humans and feelings and stuff. You'll need a webcam to play with this project. >> Hello. Greetings and salutations. As you know, I'm here as part of a Keplerian delegation to learn more about the human world. Tell me your favourite things about humans. >> Greetings. Hi. Yo. Heya. 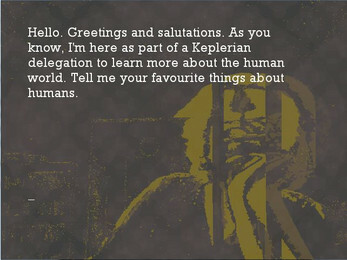 I'm from an earth-twin planet called Kepler and I want to know about humans and stuff. I want to know about humans too! 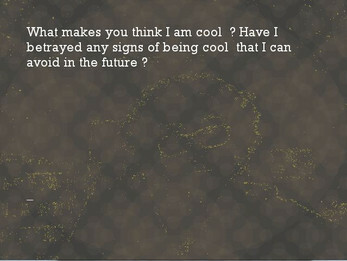 >> What would it mean to you if you got to know about humans too ? Seriously, what would that even look like? I don't know anything about humans. >> Of course you don't know anything about humans ! Isn't that illegal ? It is not illegal for humans to know about humans. >> Is this some strange human custom? I'm not sure I understand. >> You are sure. Remember: if you ever visit Kepler, certainty is a thought crime. >> Please go on. Does this have something to do with the Internet ? Everything reaches the internet at some point. >> On Kepler, that might be considered an untoward suggestion. >> You say you understand ? On Kepler, you could lose an eye for that. Kepler sounds like a harsh place. >> The swim to understanding is filled with eddies, currents, and large predator fish. Oh - that ? Just an old Keplerian saying. >> We were discussing you -- not me. 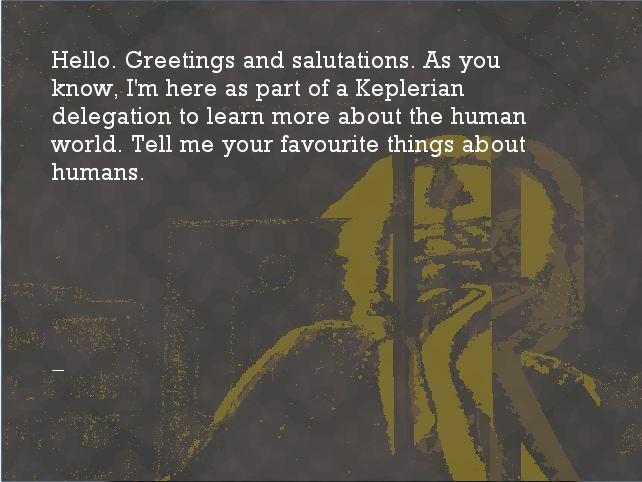 I'm here to gather information on humans, not to allow humans to gather information about Keplerians. >> A nematode in the pod is worth twenty in the toxic ooze that covers all known surfaces, as they say. >> Goodbye. Thank you for facilitating the Keplerian invasion.